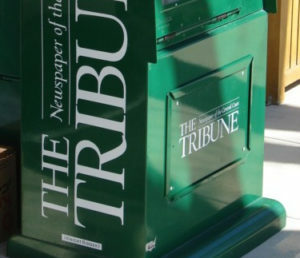 The Trib is a shadow of it’s former self and they have no one to blame but themselves. We subscribed for years but the political agenda veered so far to the left that they make New Times reporting look balanced. video killed the radio star and the internet killed the newspaper. when the lightbulb was invented I’m sure kerosene sales took a hit as well. The business is now obsolete. McClatchey and the SLO TT is a failed business model, and that is becoming apparent. If the paper is printed out of town and their focus is shifting to digital print, why do they need an office at all? McClatchy could save money by giving them library cards and they could file their stories using the computers at the City-County library. With a simple internet connection, the liberals on the SLO TT editorial board can just sit at home smoking weed, and file their garbage editorials after watching their heroes at MSNBC! I read if for the obits….everything else, sports, local news, not worth the price. Someday it will be gone entirely I hope!! I agree. The obits is something that they can’t fudge on. The ultimate obit will be theirs.